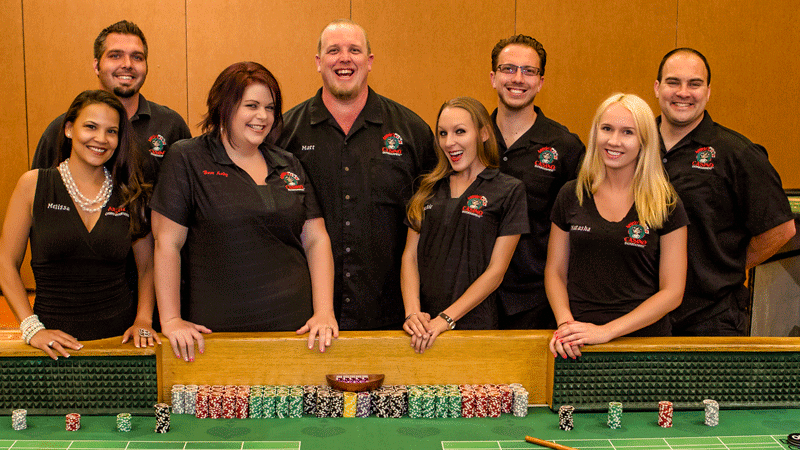 With years of actual casino experience, we have earned the right to call ourselves “THE REAL DEAL”. We pride ourselves on hand selecting our friendly, high-energy dealers and personally train them to meet a standard that sets us apart in the industry. 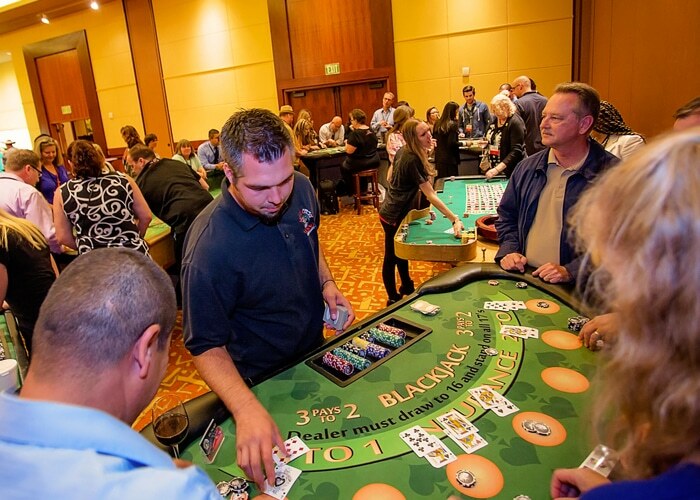 Angela’s Casino Entertainment provides high quality casino events for any occasion with authentic casino-quality tables and accessories. The result is an event that brings the feel of Vegas right to you. We provide a level or service and quality that is second to none while keeping our prices competitive. Angela began her career in the casino industry right out of high school in 1995. She worked in various casinos around Washington State and also in Lake Charles, Louisiana. She quickly learned all of the games within the casino, enjoying the Craps pit the most, and then moved through the ranks of the gaming floor and held many different management positions during her 10 years in the casino. The appeal of the fast-paced casino life was fun, yet Angela wanted a steadier environment for her family. While attempting to change career paths all together, Angela and her family moved to California for what turned out to be a life changing adventure. While looking for work in late 2005, Angela stumbled upon a casino company in the LA area, and decided to check it out. She loved the casino party concept, but wanted to try the concept on her own with new, fresh ideas, all while offering a more “real” casino experience. Being that she was based in Corona, CA it only seemed fit to start right in her backyard, since the company she had worked for didn’t even offer service to the entire Inland Empire. So in May, 2006 she began buying tables and Angela’s Casino was born. Right from the beginning, Angela had a vision in mind for her company. Obtaining quality casino equipment was truly important, insuring her selection was top notch in every aspect, all the way down to the “small” things, such as the 11.5 gram casino grade chips, to the authentic casino dice on her craps tables. She personally selected her staff and based her hiring on their personalities, not just their dealing capability. She trained her staff specifically with entertainment in mind and takes great pride in the fun out-going staff she sends out to her events. She also knew that if people were willing to pay for the casino concept, she wanted them to be truly satisfied with their event and started offering custom items that other companies didn’t, such as Custom Funny Money, using peoples’ pictures to really personalize each event. From that the custom line grew into custom casino invitations and now we offer a complete line of casino creations personalized for each and every event. What started out as “hey I can do this” turned into Angela’s dream job, complete with Event Planning, all while incorporating her passion for the casino industry. When the economy took a turn for the worse shortly after, Angela saw a great need for non-profit organizations and casino fundraisers. All too often, Angela would receive a call from an event coordinator organizing a fundraiser, and would hear “We’ve been doing this for a few years, and have never turned a profit” or “We thought the idea of a casino fundraiser would be a good idea, but we have no idea where to begin”. Angela began working with her sales staff on creating a program specifically for casino fundraisers, teaching these organizations how to run a successful – and more importantly – a profitable fundraiser. Angela and her sales staff take a personal approach to each and every one of the fundraisers they provide for, meeting with them upon their initial consultations, assisting them through their event every step of the way, insuring that their night is a success. “You can tell you love what you do – it shows in your work” is a common phrase Angela hears. She loves that she has created a life that she enjoys what she does, all the while being able to be there for her growing family. Angela is now married to her husband Matt, who also works with the company, and together they raise her twin sons, Andrew and Austin. Her boys make jokes to her staff that “one day they’ll be their boss”… who knows? The next generation of this business is right around the corner.